This month, in celebration of Fight Club 2 #4 (in stores and online today), we've got a conversation with series artist Cameron Stewart, the acclaimed writer/artist whose credits include projects like Seaguy and Batgirl. Stewart is an Eisner Award and Shuster Award-winning and Eagle Award and Harvey Award-nominated Canadian comic book artist who has worked for DC, Marvel, and Dark Horse Comics. 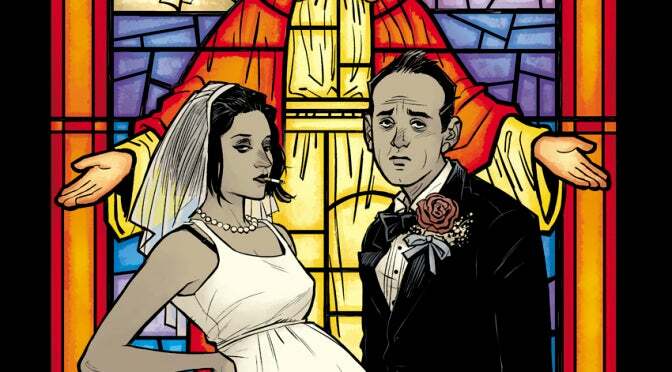 You can read our series launch interview with Fight Club creator and series writer Chuck Palahniuk here, and our conversation with cover artist David Mack here. How did you come to be involved with Fight Club 2? I actually approached them. I’d heard through the grapevine that the project was happening and that Dark Horse was going to be involved. I had a relationship with Dark Horse in the past because they had published my own graphic novels and I’d done some work for BPRD. So I had a relationship with Scott Allie, our editor, so when I found out that it might have been published through Dark Horse, I contacted Scott and expressed my interest. He told me that ultimately it was going to be Chuck’s decision and that they were looking at a bunch of different artists but that they would keep me in mind. I kept on them and what I ended up doing, was a three-page comic where I adapted one of the later chapters of the novel as a proof of concept, to show what it would look like if I were to do it and it actually went over really well. They showed it to Chuck, and Chuck thought that it looked great. When I first started talking to him about it, Scott hadn’t read the script and I think he was having trouble envisioning my art with it, but once he read the script, he told me that he went from thinking I wasn't the right artist for it to thinking I was the only artist for the job. One thing basically everyone has commented on is the pills and other objects obscuring some of the art and lettering. How early did that come into play? Was that you, or was it scripted? Yeah, that was a Chuck [Palahniuk] decision. Very early on in the process, we were getting together and talking through some of the visual things we wanted to do. He was very interested in this idea of, in the same way that David Fincher had these sort of fourth wall-breaking elements, where you would see the characters talk to the camera or the sprocket holes in the film or whatever. We wanted to come up with ways that we could also do that in the comic -- things that would reinforce the idea that you were reading the comic and have these things that were almost distancing you from the story. We were talking about things like manufacturing printing errors and one of the things that Chuck mentioned was the idea of obscuring parts of the artwork from the reader, this idea of occlusion. He actually said that he wanted to visually annoy the reader who’s going through it and seeing these things and thinking that there’s perhaps something important behind this thing that’s obscuring it. This idea of Tyler Durden being a force outside of the story and kind of f---ing with what what you’re reading. We wanted to do something that was unique and surprising and it’s a technique that’s not usually seen in mainstream comics. Anything we could do to make it kind of stand out. Obviously you’ve done projects in recent years that run the gamut from the indie to as commercial as you can get. Is something like that -- trying to do something you don’t usually see in mainstream books -- something that attracts you to a project? I think I look for projects that have that element already present. I try and choose stuff that I think will allow me the opportunity to do interesting, creative things because I want to keep myself interested. I’m not interested in doing stuff that’s just going to be repetitious. When I choose something, I already have kind of a sense of what it’s going to be and what I’m getting into. I naturally gravitate toward things that are going to allow me to flex a new muscle. Considering how large the film looms in the mind of the audience, and the likeness rights issues involved with actually using the actors’ faces, was it a challenge to design the characters in a way that struck a balance between being recognizable without actually drawing too much from the film? Yeah, I mean it was a really difficult challenge. The film is so completely embedded in the popular consciousness. They’re iconic versions of the se characters as far as the general public is concerned. It’s not even just the actors; it’s the fact that the visuals are owned by 20th Century Fox. People are confused as to why we didn’t call him Jack because it’s taken as a given that the narrator’s “name” is Jack. But that’s an invention of the screenplay so we couldn’t use that in the comics. We had to stay clear of all of that. There’s no real better resource for me than having direct access to Chuck himself. I can ask him what he had in mind for the character and what he wanted to see, so a lot of the initial direction, when we were sitting and talking about it at dinner, I could sketch out Tyler’s hairstyle and go, did you want it to look like this, or did you want it to look like this? And he could point at a sketch. Rather than that vintage sort of grunge look in the film, Chuck wanted this idea of where when it’s Sebastian the clothes are kind of rumpled and ill fitting, maybe he has a loose tie and collar, but Tyler always looks great. They’ll be wearing the same clothes, but they just kind of fit much nicer on Tyler because he’s the idealized version. It’s a weird thing, taking these characters and you have to make them recognizable to the reader but at the same time it can’t be anything like what they're familiar with. When Chuck gave me the thumbs-up, I figured that I had it. So far, I’ve heard a lot of people say that they felt like it captures them despite not looking like what people are used to. I talked to Chuck about the imagery from the smiley-face fire and he was quick to correct me that it was in the book and that you guys did it differently than the film. Yeah. The fire if you look at them, I made sure to do the fire differently. In the film, it’s just the eyes that are on fire, and the smile is paint, whereas in my version I made sure that the smile was also broken windows with fire, just to differentiate it. I’m a big fan of it and I’ve seen it many many times so so much of it is already kind of embedded in my mind. As I’m working on stuff, I definitely will think back to how Fincher blocked it or how the visuals looked or whatever. But I have to be careful not to directly emulate it. The PS hose in particular, I almost had to kind of look at it as a model of what not to do: I can’t do this, so now I’ve got to do something different. That’s an interesting note: do you think that being able to mimic the language of film and the blocking and body language and lighting and things is how you manage to evoke some of that feel without actually drawing anything directly from it? Absolutely. I often say to people that I feel like my work is closer to film than it is to other comics. Whenever I’m drawing something, my first instinct is to think about how I would shoot it as a film, and then once I have that in mind, then I try and filter that back through into the language of comics. I’m not one of these artists who wants to be a filmmaker and I do comics that are like storyboards and try to use this as a stepping stone to something else. I enjoy working with the specific visual language of comics, but I feel like I draw so much from film. My frame of reference for things when I’m conferring with my co-writer on Batgirl, every time I’m trying to make some kind of reference to him to what I want to capture, it’s almost always a film reference. I’ve been a movie nerd almost as long as I’ve been a comic book nerd. This particular book is also interesting because you have dreamlike elements and fantasy elements and the like, without any real clear, didactic indication that’s what we’re looking at. Yeah, I think part of it is that it’s difficult too I’m already drawing in a style that’s far removed from reality anyway. So you have that level of abstraction from reality and then, yeah, trying to within that break it down into what’s flashback and what’s a dream sequence and whatever. Certain things we're trying to do with panel shapes -- sometimes when panels are slightly askew or whatever, that could denote a fantasy or a dream sequence. Or drawing slightly more exaggerated than the other stuff is. A lot of it, honestly, is down to Dave Stewart, the colorist, who’s really great and he’s doing very subtle things as well like doing very drab, muted tones for Sebastian and Marla and whenever Tyler shows up he’s a lot brighter. He’s using subtler tones in the flashback too. A lot of the time if you were to look at it in black and white you wouldn’t realize that it was supposed to be a flashback and Dave is using a slightly different color scheme for that. I try not to handhold and I feel like the readers, or at least the readers I want to speak to, are smart enough to get that stuff without it necessarily being handed to them on platter.